Name the NBA players who were at least 7'2" and who scored at least 1,550 career points. The tallest player ever. Star of the film "My Giant"
Jazz player who averaged 5.56 blocks per game in 1985-86! Bulls and Spurs player known as "The A-Train"
I love tall people! 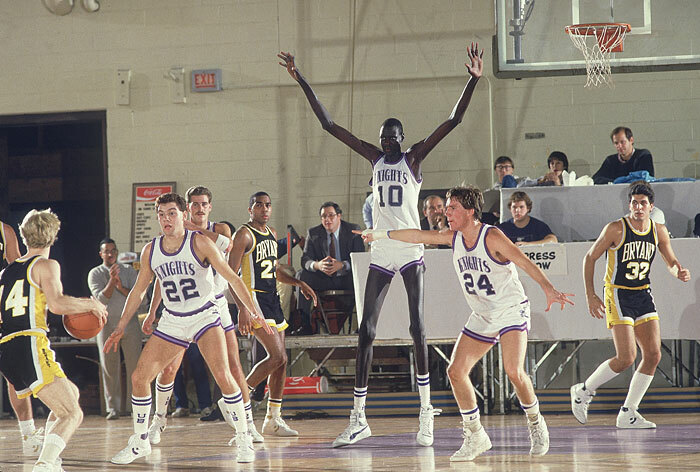 Wasn't Manute Bol closer to 7'6? I also read an article stating that some players get measured in shoes and others are measured bare feet. I know almost nothing about sports. When Shaq wasn't on this list I knew I was in trouble. I only got 1.. and after the answers were revealed I saw that I've only even heard of 2. This time I got 3. Great quiz. I got most that I had heard of, forgot Sabonis even though I loved watching him! Would have been helpful to have the team(s) that they played for! Shaq was 7'-1" and I believe Olajuwon was as well. I did really poorly on this one. When those two and Wilt Chamberlain can't make a list of tallest players you know it's a real freak show. Chamberlain was a great player, one of my favorites, but sadly he's not on this quiz because he's only 7'1. I tried "asdfnboaujakdkskkkshdf" for Ilgauskas. I think this should count. I kept trying to put all the H's in Muresan's last name. I knew he had a few of 'em. Only eight percent got Artis Gilmore? That's pathetic! Otherwise unremarkable for Tommy Burleson? Helped David Thompson dethrone the UCLA dynasty. Beat Lefty Driesell's best Maryland club almost singlehandedly in the best ACC tournament game ever. And he's from NC State, not North Carolina. Haha. Changed the clue a little. His pro career was unremarkable. Can't believe I missed Breuer. He played for the Bucks when I was a kid in Milwaukee. Seemed like a nice enough guy but I could never understand why he'd miss a layup (or for that matter why he didn't dunk everything when he knew he missed layups at times). First of all, who the hell is Primoz Brezec, and 2nd of all, Hibbert was traded to the Lakers, so he currently is no longer a "Current Pacers star", he is now a "Current Lakers star"
Should accept Alcindor for Jabbar, as that was his name at the beginning of his career with the Bucks. How about Boban Marjanovic? He is currently on the Spurs roster and he is 7 foot 3. He'd have to play about 7 more years at his current scoring rate! You can tell this quiz is old when the clue for Roy Hibbert is "Current Pacers star." Also, the clue for Shawn Bradley is just perfect. The problem is that some of the tall people you have never even heard before. Needs to be updated on a few questions- most recently, Porzingis was traded to the Mavericks. Those two are not even close to 1,550 points.